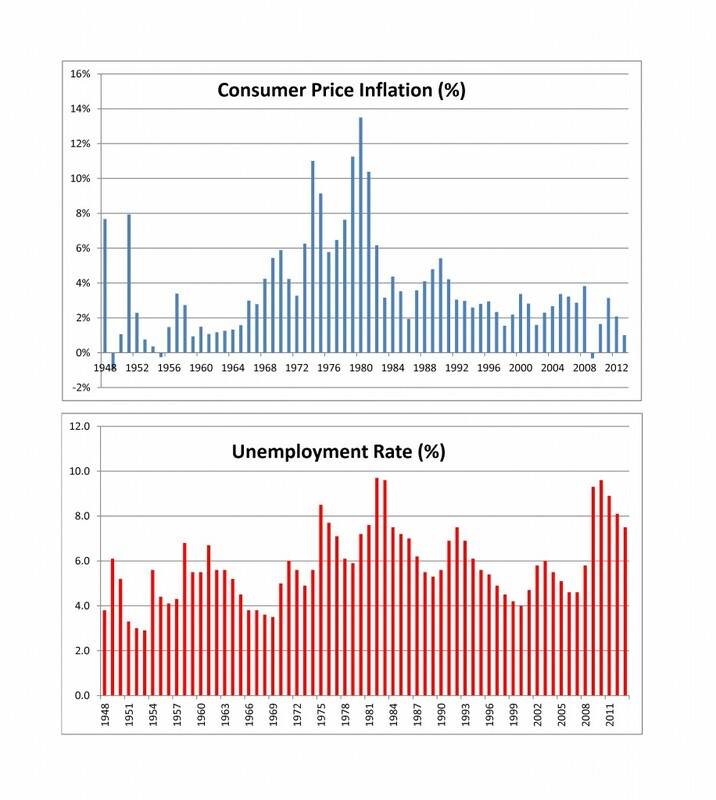 The charts show the twin concerns of the Fed: inflation and unemployment. Despite fears that easy money would send inflation surging, it is quietly fading away. The real worry is unemployment. While declining, at 7% recently it remains above any estimate of full employment. Low inflation and low unemployment can be in conflict with one-another. Cutting unemployment requires a stronger, faster growing economy while keeping inflation low can be helped by economic slack, minimal wage growth and a soft job market. To add to the challenge of meeting two opposing targets, the Fed’s current policy tools — the Fed funds rate and buying bonds – are tightly linked and can’t easily target two conflicting goals. In 2014 the Fed is expected to keep interest rates low with the Fed Funds rate targeted at zero to 25 basis points, essentially the zero lower bound (ZLB). First, they have said so on numerous occasions, second with inflation at one percent and falling there is little justification for raising rates and third, many more analysts and investors argue about bond buying than about interest rates. The bond buying, better known as quantitative easing or QE 1-2-3, will be cut back and probably extinguished completely in 2014. The Fed began the shrinking process in December after a couple of false starts, markets surprisingly welcomed the change with a rally in both stocks and bonds and there does seem to be a limit to the size of the Fed’s balance sheet. The chief fear engendered by bond buying was that massive increases money would turn into much higher inflation. That hasn’t happened. QE 1-2-3 generated a lot of hot air but no inflation. What if the inflation fears aren’t misplaced? Should prices begin to rise, the Fed would drop the ZLB target for Fed funds, interest rates would rise and any remaining bond buying would vanish. Given the last few years of ZLB and QE 1-2-2, this doesn’t look very scary. If unemployment doesn’t drop further, will there be a QE 4? While this is a harder question to answer, the response is no. After three rounds of quantitative easing, the search would probably be on for other ways to boost the economy. One side effect of QE 1-2-3 has been rapidly rising asset prices for both stocks and houses, fast enough to make some that whisper bubbles are here again. The best alternative policies are outside the Fed’s domain: increased fiscal stimulus and a higher minimum wage. However, both attract politicians and 2014 is a Congressional election year and also the preliminary bout for 2016. So the more exciting action may shift from the central bank back to the legislature after four or five years when the Fed seemed to be the only serious economic player.